Candy pink peonies are hot and happening! Sugar 'N Spice is such a peony: she gives you the feeling of a summer night or a passionate kiss. 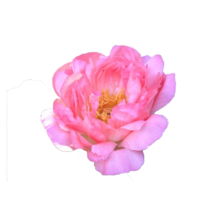 To us, this peony symbolises youth. She is a single flower which makes her early available. Her steals are firm, her buds are big and her way of blossoming is elegant and sensual. Sugar ‘N Spice was created by Allan Rogers. She blossomed for the first time in 1981. Almost seven years later, Rogers decided to go to the American Peony Society to register her. Because of her yellow open heart, Sugar ‘N Spice looks like a poppy. As you would expect of a poppy-like peony, she fits perfectly into the well-known field bouquets.